This is an extended version of my original Study Focus product, providing you with the ability to use this music aid over a much longer study period. Study Focus Extended includes a longer version of the ‘Pulsating Synth' background sound, which is very popular in the shorter version. This new extended version also includes 5 other different background sounds, for more variety, plus some added effects. This isochronic tones session cycles through a frequency range of mid-beta frequencies (14-17hz), which will help to boost your focus and concentration levels. It's an ideal study aid music session when you want to increase your focus while studying, reading, or engaging in any mentally taxing activity over a longer period. 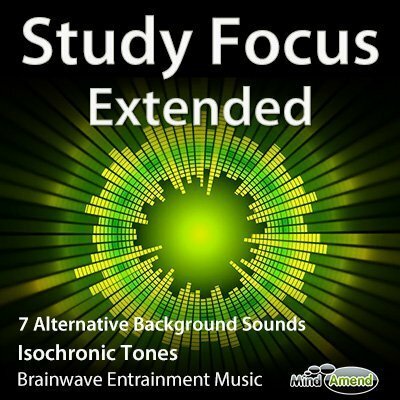 This new much longer version of Study Focus features 5 new background sounds, and I've also used additional brainwave entrainment effects in the soundtracks. So, if you already have the original shorter version, you'll still find value in upgrading to this new extended version. I've included the ‘Pulsating Synth' background sound, which was very popular in the shorter 30-minute version of Study Focus. You'll also find 5 new background sounds which are different to those on the original Study Focus. Study Focus Extended is also available as part of the Study Aid Collection, which offers a package deal saving of 40% off.